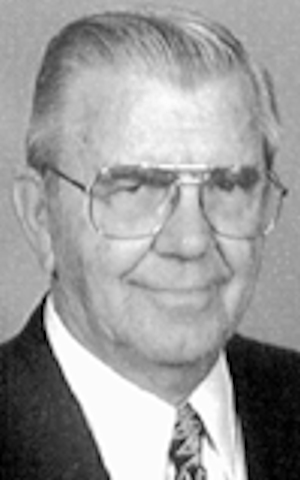 Obituary – Thele, Louis Anton « Perry High School Alumni Association, Inc.
Louis Anton Thele, 77, of Oklahoma City passed away June 29, 2005. He was one of eleven children born to Louis W. and Anna Miksch Thele on August 14, 1927 in Perry, Oklahoma. He graduated from Perry High School and went on to serve in the Navy on the U.S.S. South Dakota and the U.S.S. Lowry in World War II. Louis was a life member of the United Brotherhood of Carpenters. He was a member of the Coronado Club where he met his future wife, Mary Claire Knisell. They were married on February 27, 1954. Their union blessed them with four children. Louis was a member of St. Francis of Assisi Catholic Church where he served as a communion minister and as a member of the parish council. He was a life member of the Knights of Columbus and has served as Grand Knight. Louis was a master craftsman who shared his gifts with his parish, Rosary School, family, neighbors and friends. He will always be remembered for his willingness and generosity to serve in helping a neighbor, delivering Mobile Meals or organizing Thanksgiving and Christmas baskets for those in need. Louis was preceded in death by his parents; sisters, Catherine, Gertrude, Anna, Dorthy and Francis; and brothers, Leo, Edward and James. He will be deeply missed by his wife of 51 years, Mary Claire; sons, David of Oklahoma City, Steve and his wife Tammy and granddaughter Megan of Yukon, Tom and his wife Terri, granddaughter Laura and grandson Michael of Allen Texas; and daughter Mary Margaret of Oklahoma City. He is also survived y his sisters Regina Leutkemeyer of Oklahoma City, Mary Nelson of Stillwater and sister-in-law Sally Thele of Glenellen, IL. An Evening Prayer service will be held on Friday, July 1, at 7:00 p.m. at Smith & Kernke, 1401 NW 23rd St. A Mass of Christian Burial will be held at 10:00 a.m., Saturday, July 2 at St. Francis of Assisi Catholic Church, 1901 NW 18th St. Interment will follow at Resurrection Memorial Cemetery.